DDD is a company that provides high-quality manufacturing, marketing, sales solutions and robust international distribution. The company asked us to advise them on a high quality presentation solution for their 3 meeting spaces of their newly refurbed offices. They wanted a screen to present on along with the ability to mirror from a mobile device to the screen wirelessly in each room. The remit for the largest meeting room/boardroom was to include 2 presentation areas; one at each end of the room, which would be devided by a sliding partition. We installed a 49” commercial, smart TV into this small 4-person meeting room. This was mounted on an articulated mount due to the awkward layout of the room. This is a 6-person meeting room. We supplied and installed a 65” commercial smart TV into this room. 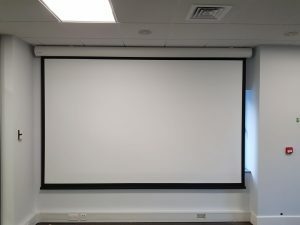 Both rooms had the requirement to connect a mobile device to the screen wirelessly and therefore we installed the BenQ instaShow to fulfil this requirement. The third room was a large meeting room/board room with the ability to be split in two via a sliding partition. We therefore recommended and installed a 3m electric screen at one end with a 5000 lumens projector. 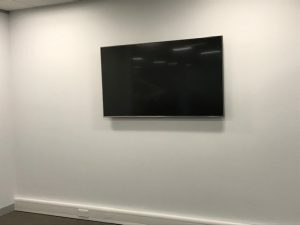 They also required the ability to mirror or cast wirelessly to the projector from a mobile device and therefore a BenQ instashow was installed at the projector. 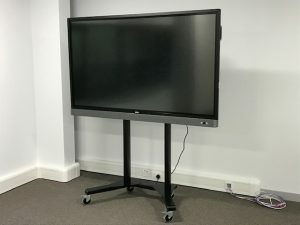 At the other end of the meeting room, a mobile interactive solution was requested so we recommended and installed a BenQ RM7501K 75” interactive touchscreen. We installed the screen onto a fixed height mobile trolley so that the equipment could be utilised in other rooms if necessary. As a result of the mobile nature of the screen, the customer also wanted to mirror a mobile device onto the screen. This was achieved using the inbuilt instaQ Share app on the screen. The customer also requested sound reinforcement across the room, therefore we installed an audio solution that incorporated 12 ceiling mounted Ecler IC6 speakers, along with a 4-in 4-out audio matrix. The source and volume, of which can be controlled via wall panels independently in both halves of the room. The audio output of the projector as well as the audio output of the screen was pointed at the audio matrix. Due to the mobile nature of the screen, the audio output of the screen was sent to the matrix via a wireless audio sender, therefore giving the customer complete flexibility in both rooms. 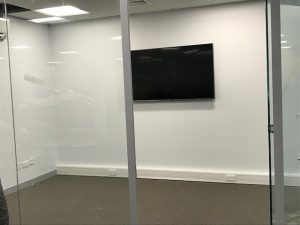 “DDD were looking to introduce high quality meeting facilities to a new office build, so we gave our brief to Paul at Protech and he advised us on the best solution to meet our needs. 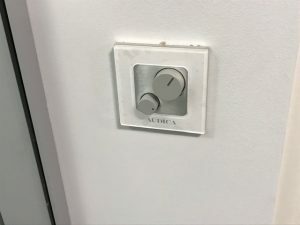 We are delighted with the equipment supplied and installed in each of the 3 meeting rooms and the quality of the installation and performance of each solution has far exceeded my expectations. I would not hesitate to recommend Protech Solutions to other businesses looking to improve their meeting room and office facilities.